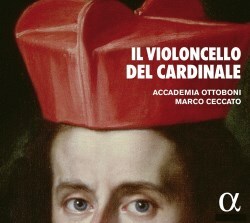 The cardinals referred to in the title of this release are Benedetto Pamphili and Pietro Ottoboni, who were in Rome as the seventeenth century closed and the eighteenth opened. They presided over a time when the city played host to three of the greatest names in Italian music: Corelli, Alessandro Scarlatti and Handel. The former directed a major orchestra which included four of the composers on this recording, all of whom were cellists: Amadei, Haym, Lulier and Perroni. I doubt that I’m alone in not knowing any of these names. Indeed, the only name I recognise at all is that of Bononcini, but I believe this to be the first of his music that I’ve heard. I’m not going to attempt to describe each work individually, partly because I’m sure you already have a fair idea of what late Baroque cello and basso continuo music will sound like, but mostly because the works have tended to rather merge into one another. This is my main criticism of the release: whether by choice or by necessity, there is not a lot of variety in the works that have been selected. More than half of the 63 minutes are occupied by slow, fairly sombre music, and even the contrasting faster movements seem to blend in, lacking as they do much in the way of dynamic variation. Is that a choice made by the performers or imposed upon them by the scores? I don’t know. My colleague Johan van Veen, in a review of Vivaldi sonatas by these players, commended them on their very clear distinction between different tempi. I have to say that I don’t hear that clearly here. If andante is akin to walking pace, then these are very stately walks indeed, taking us too close to adagio. Admittedly, the allegros and prestos are about right, but as I have already remarked, some of that energy is lost by the uniform dynamics. If I was to pick a single work as the best, it would probably be the Bononcini sonata, which might also suggest why his name has survived slightly better than the others down the centuries. The Vivaldi cello sonatas mentioned above were initially released on Zig-Zag Territoires and then reissued on Alpha (review). As far as I can tell, this is a new recording. I am impressed by the timbre of the instruments. Marco Ceccato’s cello is beautifully rich, and the harpsichord is not at all jangly, though I suspect this is partly the effect of careful microphone placement – thank you to the engineer. The booklet notes provide good biographical and historical detail. If you have gained an impression that I haven’t enjoyed this release, please let me assure you that this is an interesting selection, given the obscurity of the composers, and lovingly performed. All I would have liked is a little more variety, especially in the playing.